Welcome hoppers! This is a huge event with 176 participating authors and all are giving away a prize. Plus, there is a grand prize offered up by the hop planner. Who can't use a Kindle Paperwhite these days? 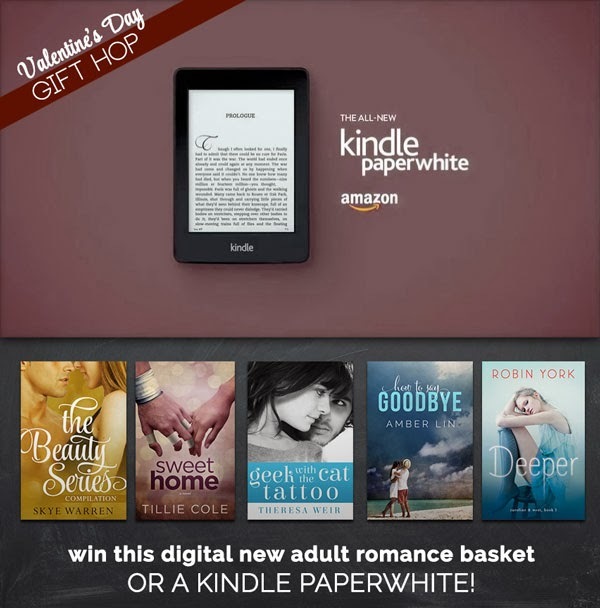 And look at the new adult romance basket (below) also up for grabs. The main thing is have some fun while discovering new authors and blogs. To enter for my giveaway please leave a comment with your email addy, answering the following question - What one Valentine's Day treat is a special tradition for you? Is it receiving a bundle of your favorite flowers? A special piece of jewelry with a certain stone, like a ruby, in it? Maybe you have a favorite restaurant or place you like to go that you only go to for Valentine's Day. This year I most likely will be babysitting my grandchildren so my daughter and son-in-law can have some time to themselves. Valentine's Day is for lovers of any age, and unfortunately my special someone passed away. But if I was celebrating I'd probably stay in and enjoy a special meal with him. A pretty table set with flowers and candles, a bottle of wine, and soft music playing in the background. Maybe later we'd do a little dancing, or watch a movie. Just the two of us, sharing some conversation and each other. Oh! I almost forgot to mention what I'm giving away. A $10.00 GC to Bath and Body Works! Enter the rafflecopter below. Wow! Awesome giveaway! Thanks for participating! I don't have a special tradition...usually just dinner and a romantic movie for us. Nothing special for me. My husband tries though and sometimes he does a great job! I don't have a special tradition. Sometimes I've received roses...sometimes jewelry. I think the most special thing would be just to share the day with who you love. Thanks for being part of this hop! 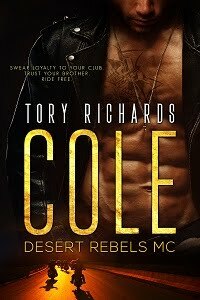 Am loving finding new to me authors. Hugs to you as you are missing your Valentine this year. Honestly after 15 yrs of marriage, I'm happy to just spend time with my husband. This year we're going away for a romantic weekend. What a sweet gift you're giving your daughter and son-in-law with babysitting so they can enjoy Valentine's Day together. That's so touching. A meal coupled with a chance to ignore the outside world and spend time enjoying each other's company is the tradition I like the most about Vday! Ii like to get a nice box of truffles and go out to a nice restaurant. Hubby and I always make sure we have private time on Valentine's Day! V-day treat? Gotta have butterfinger hearts. Mmmm. I really don't have one! Maybe I will have to start a new tradition! For me, it's always about the card, whether the one I give or the one I get. It just means so much when someone takes the time to give me words of love. I get chocolate covered cherries every year, it is simple but something that started when I was a young kid so holds a lot of memories. Spending time with my son is the specialist thing for me because I wasn't suppose to have kids. I get to celebrate his birthday then backdoor it with Valentines day. I love it. My husband and I don't have a special tradition. For years money was tight and I didn't see the need to spend it on the outrageous cost of flowers or chocolates. Maybe our one tradition is buying the Valentine's day candy after Valentine's when it is 1/2 off (lol). I love going out with my hubby to our town's Wine and Chocolate Tasting. We don't really have any traditions, but I'd like to start a new one where my husband buys me a book each year lol. Thank you! Me and my husband go out to eat each Valentine's Day, that is the special tradition I look forward to each year. I don't have a special V-day tradition. I don't usually celebrate V-day and have never had a special someone to celebrate with. we do not have any traditions, seems like I need to change that! I don't have one. Valentine's Day is just another day for me. My husband and I make cards for each other. He always leaves a flower with the card. No special treat, but a romantic dinner and movie at home with the hubby is great. I love the handmade gifts from my kids! I agree, handmade gifts from the kids warm my heart.My husband is not a romantic. Passionate yes,romantic, not so much. I treat myself to a massage! Home made Valentines, special treats, flowers, spending time with family, intimate getaways, being thankful for what you have, buying marked down candy the day after (chuckled at that one)massages, thank you all so much for sharing your thoughts with me. I hope you all had fun during the hop and win something. Take care everyone. We always stay at home with the kids & have dinner. I thought the hope went through the 15th. OOPS. OMG, my bad! I got my days mixed up and announced a winner a day early. For those of you who posted after the 14th and I announced the winner of the GC please email me and I will send you a coupon for a free download of one of my books. Sorry! A stuffed animal every year for me.